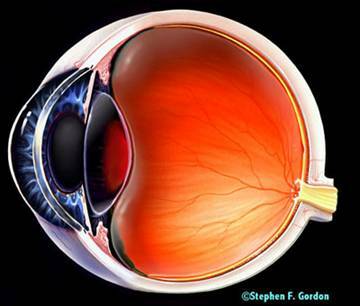 Glaucoma is a disease of the eye characterized by loss of vision due to optic nerve damage. Roughly 105 million individuals worldwide are afflicted by glaucoma, while approximately 5 million are blind as result of glaucoma related complications. While doctors and scientists alike are hesitant to name any one cause of glaucoma, there is a general consensus that elevated or abnormally high pressure within the eye (intraocular pressure or IOP) is associated with glaucoma and optic nerve damage. This website will focus on primary open angle glaucoma (POAG). It is a broad category of glaucomas that excludes those caused by a simple malformation of the iris cornea angle. As result, the focus of treating the disease has traditionally been geared at lowering intraocular pressure with the goal of curtailing optic nerve damage. Treatments include drugs targeting glands responsible for producing the fluid (aqueous humor) within the eye, surgical manipulation of structures within the eye responsible for maintaining pressure, and even implantable drainage devices. Emerging treatments, such as the femtosecond laser, seek to maximize pressure reducing efficacy while minimizing the invasive nature of traditional surgery. This site is intended to provide a basic understanding of the underlying pathology and physiology of the eye in addition to summarizing current treatments, ultimately shedding light on emerging femtosecond laser technology and its specific application in glaucoma treatment.